(4) S'rî S'uka said: 'In the Kâlindi there was a certain pool where Kâliya [as the serpent was called] resided and its water boiled because of the fire of his poison. Birds flying over it would fall [dead] into its waters. (5) All plant and animal life on the shore died because it came into contact with the poisonous vapor that by the wind was carried from the waves. (6) Krishna had descended to subdue the wicked ones. Seeing how severely the river was contaminated by the terribly effective, powerful poison, He climbed in a Kadamba tree, slapped His arms, tightened His belt and jumped into the poisoned water. (7) The water of the serpent's lake in turmoil from the poison that the snake was vomiting, started because of the force of the fall of the Essential Person to overflow on all sides so that its fearsome waves washed over the shore for a hundred bow lengths. What an immeasurable strength that was! (8) My best one, when the snake heard the sound that Krishna produced while He, playing like a big elephant, with His mighty arms was engaged in whirling the waters around, he rushed forward, unable to tolerate the violation of his territory. (9) And while He, so attractive in His yellow garments and as delicate as a glowing white cloud, with the S'rîvatsa, His smiling beautiful face and with His feet which resembled the inside of a lotus, thus fearlessly was playing, He was angrily bitten in the chest by him and enveloped in his coils. (10) Seeing Him in the grip of the snake's coils being immobilized, His dear friends, the tenders of the animals, were greatly disturbed. With their intelligence bewildered, in pain and full of remorse and fear, they fell to the ground, for they had dedicated everything, themselves, their relations, their wealth, their wives and objects of desire to Krishna. (11) The cows, the bulls and the she-calves with their eyes fixed on Krishna, cried out loudly in great distress while they fearfully lamented in shock. (12) Thereupon most fearsome, ominous disturbances arose in Vraja. Three kinds of signs, to be observed in the sky, upon the earth and in the living beings, heralded imminent danger. (13-15) The cowherds headed by Nanda who saw these signs were beset with fear. They knew that Krishna herding the cows had left without Balarâma. Not knowing His prowess, they were overwhelmed by pain, grief and fear. Because of those bad omens they thought that something bad had happened and could only think of Him who was their very life breath. The children, the elderly ones and the ladies my best one, all felt as wretched as a cow missing her calf and anxiously set out to look for Krishna. (16) Balarâma the Sweet Supreme Lord seeing them that distressed, gently smiled and did not speak a word, knowing well the power of His younger brother. (17) Searching for their dear most Krishna they followed the trail marked by the footprints of the Lord. They led to the bank of the Yamunâ. (18) Quickly they followed the marks of the lotus, the barleycorn, the elephant goad, the thunderbolt and the flag of the Master of their community my best one, that they here and there, dispersed between other footprints saw on the cow path. (19) When they at a distance saw Krishna motionless within the lake enveloped by the coils of the snake body and the cowherd boys lying unconscious in the flooded water with all the animals crying around them, they in their distress were delivered to the greatest despair. (20) Now that their sweetheart was seized by the serpent, the gopîs who in their hearts were so attached to Him, the Supreme, Unlimited Personality, while remembering His loving smiles, glances and words were tormented by the greatest agony. Being deprived of their darling, they experienced the three worlds as being completely empty [see also S'ikshâshthaka verse seven]. (21) Holding back Krishna's mother, they with their eyes fixed upon her son, equally pained shed a flow of tears. Standing there like corpses they stared at Krishna's face and one by one recounted the stories about the Darling of Vraja. (22) Nanda and his men seeing Krishna, their life and soul, were by the All-powerful Lord Balarâma who knew well the might of Krishna, withheld to enter the lake. (23) When He, the only one they had, for some time was caught in that position and saw how His cowherd folk on His behalf was standing there in utter despair together with the women and children, He put an end to His imitation of the mortal way [the illusion of His mortality] and rose up from the coils of the serpent. (24) By expanding His body the serpent was forced to let Him go because of the pain. Kâliya thereupon furiously raised his hoods high, breathed heavily through his nostrils that were like two vessels of boiling poison and stared the Lord in the face with eyes like firebrands. (25) Kâliya, moving his double-pointed tongue to and fro between his two lips and with his terrible look full of poisonous fire eagerly spying for an opportunity to strike, was by Him playfully approached from all sides by moving around him like He was the king of the birds [Garuda]. (26) Thus turning around him He exhausted him and forced him to bend down his highly raised shoulders. Krishna thereupon climbed on top of the broad heads and then, as the Original One, the First Spiritual Master of All the Arts, started to dance. His lotus feet in touch [with the snake] therewith turned red from [the light of] the many jewels on the heads. (27) That very moment His servants arrived together with their wives: the heavenly singers and perfected souls, the sages and the venerable ones. Taking notice of Him being engaged in His dancing, they all were greatly pleased [and expressed their joy] with playing two-sided clay drums, smaller drums and large drums, and with songs, flowers and other forms of praise. (28) Whichever of Kâliya's one hundred-and-one heads would not bow down my best one, were immediately trampled down by Krishna. The Lord who with His kicking feet punishes the evil ones, made the serpent that still moved but the life of which ran at its end, spit horrible [poisonous] blood from its mouth and nostrils while it experienced the greatest anguish. (29) Poison oozed from his eyes and whichever vomiting head that he breathing heavily in his anger would rise, Krishna, while dancing, with His foot forced down into submission. Every time that happened He with flowers was worshiped for being the Original Person. (30) Profusely vomiting blood, with his numerous hoods broken and with his body defeated by His amazing dancing, oh ruler of man, Kâliya remembered the oldest person, Lord Nârâyana, the spiritual master of all moving and nonmoving entities. Within his mind he turned to Him for shelter. 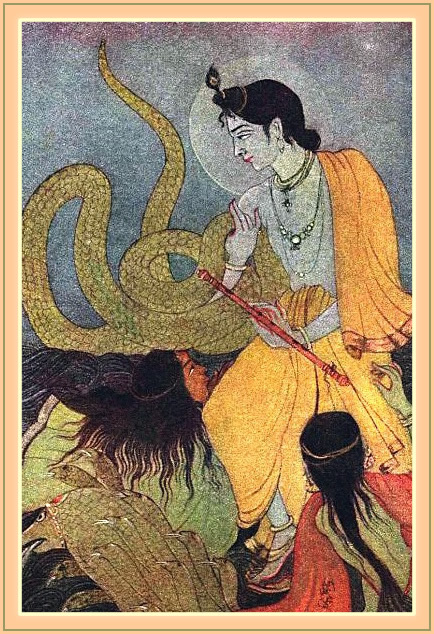 (31) Seeing that the serpent got tired of the heavy weight of the heels of Lord Krishna in whose abdomen the entire universe is found and that his umbrella-like hoods were shattered by His trampling, his wives in distress approached the Original Lord with their clothing, ornaments and locks of hair in disarray. (32) Innerly totally upset approaching for shelter, they laid their bodies and children on the ground before Him, the Lord and Refuge of All Creatures. They bowed down, saintly joined their hands and solicited the liberation of their sinful husband. Third revised edition, loaded August 6, 2013. The king said: 'How did the Supreme Lord subdue the serpent in that dangerous water and how could it reside there for so many ages, oh learned one? Please explain. S'rî S'uka said: 'In the Kâlindi there was a certain pool where Kâliya [as the serpent was called] resided and its water boiled because of the fire of his poison. Birds flying over it would fall [dead] into its waters. All plant and animal life on the shore died because it came into contact with the poisonous vapor that by the wind was carried from the waves. Krishna had descended to subdue the wicked ones. Seeing how severely the river was contaminated by the terribly effective, powerful poison, He climbed in a Kadamba tree, slapped His arms, tightened His belt and jumped into the poisoned water. The water of the serpent's lake in turmoil from the poison that the snake was vomiting, started because of the force of the fall of the Essential Person to overflow on all sides so that its fearsome waves washed over the shore for a hundred bow lengths. What an immeasurable strength that was! My best one, when the snake heard the sound that Krishna produced while He, playing like a big elephant, with His mighty arms was engaged in whirling the waters around, he rushed forward, unable to tolerate the violation of his territory. And while He, so attractive in His yellow garments and as delicate as a glowing white cloud, with the S'rîvatsa, His smiling beautiful face and with His feet which resembled the inside of a lotus, thus fearlessly was playing, He was angrily bitten in the chest by him and enveloped in his coils. Seeing Him in the grip of the snake's coils being immobilized, His dear friends, the tenders of the animals, were greatly disturbed. With their intelligence bewildered, in pain and full of remorse and fear, they fell to the ground, for they had dedicated everything, themselves, their relations, their wealth, their wives and objects of desire to Krishna. The cows, the bulls and the she-calves with their eyes fixed on Krishna, cried out loudly in great distress while they fearfully lamented in shock. Thereupon most fearsome, ominous disturbances arose in Vraja. Three kinds of signs, to be observed in the sky, upon the earth and in the living beings, heralded imminent danger. The cowherds headed by Nanda who saw these signs were beset with fear. They knew that Krishna herding the cows had left without Balarâma. Not knowing His prowess, they were overwhelmed by pain, grief and fear. Because of those bad omens they thought that something bad had happened and could only think of Him who was their very life breath. The children, the elderly ones and the ladies my best one, all felt as wretched as a cow missing her calf and anxiously set out to look for Krishna. Balarâma the Sweet Supreme Lord seeing them that distressed, gently smiled and did not speak a word, knowing well the power of His younger brother. Searching for their dear most Krishna they followed the trail marked by the footprints of the Lord. They led to the bank of the Yamunâ. Quickly they followed the marks of the lotus, the barleycorn, the elephant goad, the thunderbolt and the flag of the Master of their community my best one, that they here and there, dispersed between other footprints saw on the cow path. When they at a distance saw Krishna motionless within the lake enveloped by the coils of the snake body and the cowherd boys lying unconscious in the flooded water with all the animals crying around them, they in their distress were delivered to the greatest despair. Now that their sweetheart was seized by the serpent, the gopîs who in their hearts were so attached to Him, the Supreme, Unlimited Personality, while remembering His loving smiles, glances and words were tormented by the greatest agony. Being deprived of their darling, they experienced the three worlds as being completely empty [see also S'ikshâshthaka verse seven]. Holding back Krishna's mother, they with their eyes fixed upon her son, equally pained shed a flow of tears. Standing there like corpses they stared at Krishna's face and one by one recounted the stories about the Darling of Vraja. Nanda and his men seeing Krishna, their life and soul, were by the All-powerful Lord Balarâma who knew well the might of Krishna, withheld to enter the lake. When He, the only one they had, for some time was caught in that position and saw how His cowherd folk on His behalf was standing there in utter despair together with the women and children, He put an end to His imitation of the mortal way [the illusion of His mortality] and rose up from the coils of the serpent. By expanding His body the serpent was forced to let Him go because of the pain. Kâliya thereupon furiously raised his hoods high, breathed heavily through his nostrils that were like two vessels of boiling poison and stared the Lord in the face with eyes like firebrands. Kâliya, moving his double-pointed tongue to and fro between his two lips and with his terrible look full of poisonous fire eagerly spying for an opportunity to strike, was by Him playfully approached from all sides by moving around him like He was the king of the birds [Garuda]. Thus turning around him He exhausted him and forced him to bend down his highly raised shoulders. Krishna thereupon climbed on top of the broad heads and then, as the Original One, the First Spiritual Master of All the Arts, started to dance. His lotus feet in touch [with the snake] therewith turned red from [the light of] the many jewels on the heads. That very moment His servants arrived together with their wives: the heavenly singers and perfected souls, the sages and the venerable ones. Taking notice of Him being engaged in His dancing, they all were greatly pleased [and expressed their joy] with playing two-sided clay drums, smaller drums and large drums, and with songs, flowers and other forms of praise. Whichever of Kâliya's one hundred-and-one heads would not bow down my best one, were immediately trampled down by Krishna. The Lord who with His kicking feet punishes the evil ones, made the serpent that still moved but the life of which ran at its end, spit horrible [poisonous] blood from its mouth and nostrils while it experienced the greatest anguish. Poison oozed from his eyes and whichever vomiting head that he breathing heavily in his anger would rise, Krishna, while dancing, with His foot forced down into submission. Every time that happened He with flowers was worshiped for being the Original Person. Profusely vomiting blood, with his numerous hoods broken and with his body defeated by His amazing dancing, oh ruler of man, Kâliya remembered the oldest person, Lord Nârâyana, the spiritual master of all moving and nonmoving entities. Within his mind he turned to Him for shelter. 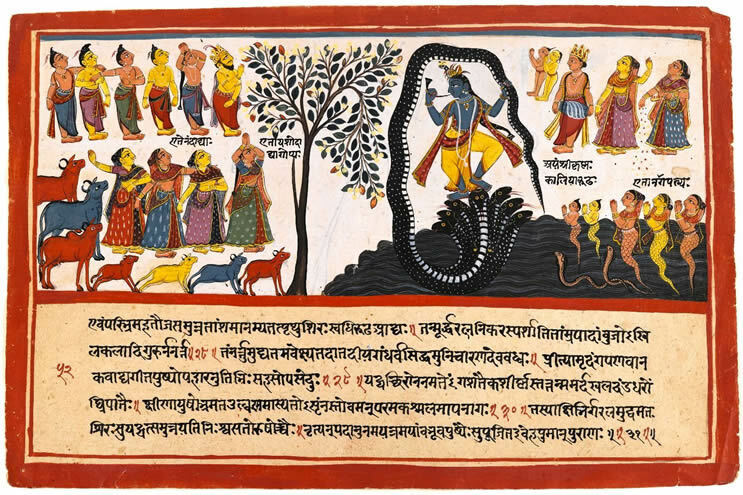 Seeing that the serpent got tired of the heavy weight of the heels of Lord Krishna in whose abdomen the entire universe is found and that his umbrella-like hoods were shattered by His trampling, his wives in distress approached the Original Lord with their clothing, ornaments and locks of hair in disarray. Innerly totally upset approaching for shelter, they laid their bodies and children on the ground before Him, the Lord and Refuge of All Creatures. They bowed down, saintly joined their hands and solicited the liberation of their sinful husband. The wives of the serpent said: 'The punishment for this person who acted against the rules is deserved. With an equal vision towards sons and foes, You descended in this world to subdue the wicked ones and punish for the sake of a positive result. This punishment of the falsehood administered by You is actually a form of mercy because by dispelling the contamination, as You did with his appearance as a serpent, You even being angry are of grace in accepting the ones embodied. Of what kind of properly performed penance has he been in his former lives, with which he, free from pride and thinking of others, religiously or otherwise being of compassion with everybody, has satisfied You, the Good Self of all living beings? We don't know what [of his actions] led to this result oh Lord. To be qualified to touch the dust of Your lotus feet is something for which the Goddess of Fortune, the best of all women, has performed austerities, has given up all desires by keeping to her vow for a long time. They who attained the dust of Your lotus feet neither desire heaven nor rulership over all, neither want to be the topmost creator nor the master of the world and neither wish the perfections of yoga nor freedom from rebirth [see also S'ikshâshthaka verse 4]. Even though he, the king of the serpents being born in the mode of ignorance oh Lord, was under the sway of anger, he has achieved that what is so difficult for others to achieve. For those who filled with desires are covered by a physical body and wander through the cycles of material existence [through different lives], all opulence will manifest itself before their eyes because of that [dust]. We offer You, the Supreme Lord, the Original Person and the Greater Soul, You, the Shelter of All that Exists, the Supreme Primordial Cause and the Supreme One in the Beyond, our obeisances. For You, the Ocean of Spiritual Knowledge and Wisdom, for You, the Absolute Truth of an unlimited potency, for You who are free from the modes and free from all changes of form, for You, the Prime Mover, there is our reverence. Our obeisances for You who are the Soul and refuge for the intelligence, the spirit, the life breath and the senses, for You who constitutes the subtle basis for the perception and the material elements, for You from whom [turned away] one falsely identifies with the three modes so that one's self-awareness is covered. We pray to You, the Unlimited One, the Transcendental One who are the center to the multitude, You who are the omniscient one and He who accepts the different doctrines [philosophies or dars'anas] and constitutes the power of the expression of ideas and words. Again and again we prove our respects for the foundation of all authoritative proof, for the author of the revealed scriptures and for the source of the Vedic texts that both restrict [nivritti] and incite [pravritti]. We bow before Lord Krishna and Lord Râma [Sankarshana], the sons of Vasudeva, as also before Pradyumna and Aniruddha [Krishna's son and grandson, see 4.24: 35-36]. Our obeisances to the Master of the Sâtvatas [the devotees of Krishna, Satvata]. Our salutations are there for Him who manifests the various qualities, He who disguises Himself by the modes but also because of the functioning of the modes can be acknowledged, He, who by His devotees is known as the [independent] witness of the modes. Oh Controller of the Senses, let there be our reverence for You who are so inscrutable in Your unmanifest state and so perfect in the state of all Your manifest forms, for You who acts so silently with the silent ones. We worship Him, the Knower of the Higher and Lower Destinations, the Regulator of All Things, You who stands apart from the universe and [yet] are the universe itself, You who are the Overseer of That and the Root Cause of this all. The ones of peace, the restless ones and those born in slowness are Your material embodiments [of the modes] in the three worlds. Wishing to maintain the dharma You [therewith being embodied Yourself] are present in this world in order to protect the saintly and the peace-loving ones dear to You. The master for once should tolerate the offense that was committed by his own subject. You, oh Peace Personified, should forgive it this foolish one [our husband] who failed to understand You. Oh Supreme Lord have mercy, the serpent is breathing his last. Since we women are pitied by the saints, our husband should be granted his life. S'rî S'uka said: 'He, the Supreme Lord, thus extensively praised by the wives of the stupefied snake, thereupon released him whose heads were defeated by His trampling feet. Slowly he with difficulty regained his senses and vital force. Breathing normally again and miserable, Kâliya spoke submissively to Krishna. Kâliya said: 'We [snakes] so vicious and ignorant by birth, are of a constant anger. For normal living beings it is difficult to give up the propensities by which they hold on to that what is untrue [their physicality], oh Lord! And we present here in this world oh Supreme Lord, are because of the serpent species bound to anger. How can we in our bewilderment of our own accord get rid of Your insuperable Mâyâ? S'rî S'uka said: 'The Supreme Lord, in the role of a human being thus hearing the words then said: 'You, oh serpent, must not stay here any longer. Go directly to the ocean with your folk, your children and women. May the wealth of the river be enjoyed by the human beings and the cows. Any mortal being who remembers this command of Mine to you and recites it at the beginning and the end of the day, will not become afraid of you. He who at the place of this pastime of Mine bathes and gratifies the gods and others with the water, will, when he remembers Me, is of worship and fasts, be freed from all sins. The honorable sage said: 'Freed by Krishna, the Supreme Personality whose actions are so wonderful oh King, the serpent together with his wives worshiped Him with pleasure and reverence. The first painting is titled: 'Kâlîya Damana' by Khitindra Nâth Mazumdar. Folio from a Bhagavata Purana (Ancient Stories of the Lord), 1718. Source: LACMA. 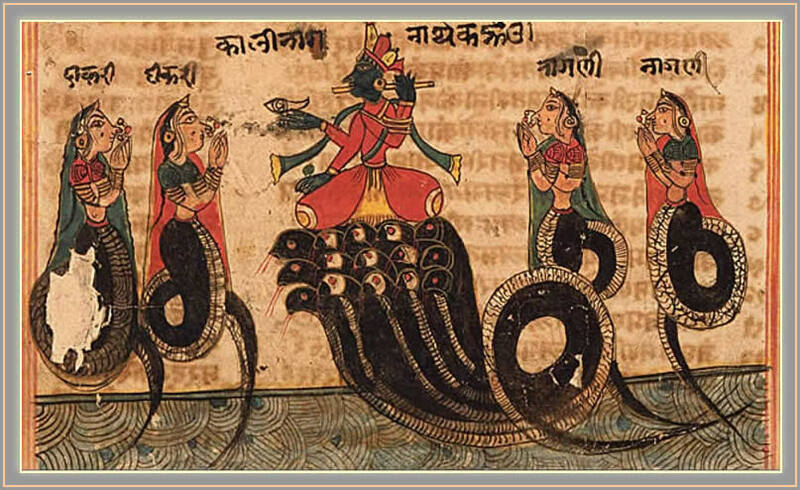 The third painting is titled: 'Krishna conquers the serpent Kaliya'. Page from a dispersed Bhagavata Purana. Source: Brooklyn Museum.